I apologize in advance – this is a pretty complainy post. But I needed to get this off my chest. Most people say that the third trimester is the hardest. Well, they’re wrong. The fourth trimester is by far the most difficult. As I held my tiny, delicate, grey-skinned cone-headed baby close in my arms just minutes after birthing her I felt so happy, tired, and proud. “Did I tear?” I asked Rebekah, our midwife. I had, just a little. It was too small to require stitches. We also learned that I had had a small placental abruption, which is a fancy way of saying that the placenta had started to separate from the uterus, which could have contributed to my blood loss. As I looked at myself in the mirror for the first time, I saw someone I didn’t recognize – pale green and overwrought. I wanted to laugh I looked so horrid. Then, the baby blues hit. The days melded into one long nightmare. I was SO sick of lying in bed and having someone else do everything for me. I dreaded nights. I was extremely tired since I had gotten basically no sleep the night of labor and adjusting to sleeping with a baby that needs to be fed every hour or so is tough. Self-pity set in. So I decided to get out of bed and do stuff. I completely wore my body out and set it up for illness. The next day I contracted mastitis, complete with fever. But it soon passed and I felt so much better. I read stories from women who had gone through mastitis, saying how horrible it was; I had gotten off easy, I thought. Then the fever struck again, much harder this time. My temperature kept rising, nearly reaching 106. Finally, after a day and half, it broke. I hadn’t had any sleep, but I was so happy to finally be recovering. Then my brain did something really strange – it wouldn’t let me fall asleep. Every time I started to drift off, my stomach gave a jump and my throat started to close. It was extremely frustrating. The only thing that would allow me to sleep was taking melatonin, and that only worked for an hour at a time. My stupid brain even went so far as to send me a scary dream about spiders to keep me from sleeping. This went on for a day or two. I felt like I would never recover. Then two of my sisters and brother came for a visit and to help with housework. It really brightened my day. That night I was able to sleep naturally. That was the hardest, most horrible week of my life. From then on I was super careful about how tired I got; I had learned my lesson. Soon I was starting to feel stronger (though taking a shower was still quite a workout) and learning to sleep with a baby that demands attention all through the night. 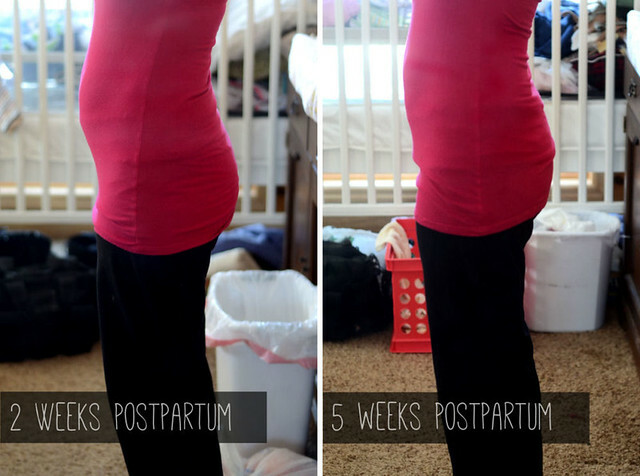 At four weeks postpartum I really started to feel better. And now, at five weeks I’m almost back to normal, besides getting winded at the stupidest things like walking up a flight of stairs. I am SO out of shape. And now for the bit that I was always interested in when I was pregnant: how did my belly fare postpartum? The first few days I looked like I was four months pregnant, minus the glowing skin and curled hair. My uterus was still large and making my belly quite poochy. I wanted to take pictures for y’all, but I was just too tired exhausted. At two weeks postpartum the “bloating” (for lack of a better word) had gone down quite a bit, but you can still see a bulge – about how I looked at eighteen weeks. And you can see in the picture below how I look standing at 5 weeks postpartum. The pooch has gone down quite a bit, but it’s still pretty flabby, particularly when I sit down or lay on my side. I checked myself, and I have a diastisis recti (a separation of the abdominal muscles). So I’ll have to figure out a program for myself to heal that. Also, my tummy looks fairly normal in some spots and like a deflated balloon in others. Whatevs. As far as inches goes, I was about 30 inches around my waist at 2 weeks, 28 at 4 weeks and now I’m 27.5 (about 1.5-2 inches form my pre-pregnancy size). I’ve got a LOT of toning to do. Aaaaand stretchies. *Le Sigh* I got so many of them the last few weeks of pregnancy. My lower belly is riddled with them. And a few decided to pop up on my legs post pregnancy. What-EVS. But I’ve heard they fade, and as long as I get my tummy toned they shouldn’t bother me too much. I guess pregnancy is a good tool to keep us humble, eh? So there you have it – my road to recovery postpartum. I can’t tell you how awesome it is to be able to put up my hair and fix myself a cup of tea. It was the little things I missed the most. I praise and thank God that we have a healthy little girl to call our own and that I had no major complications. Thanks for sharing your story and congratulations on your baby! I also had diatasis recti. After I had my last baby (I have 6 children!) I bought a BelleFit postpartum girdle. It really helps with diatasis recit recovery as well as supporting the postpartum stomach as it heals. At only 5 weeks postpartum, it’s not too late for you to try one if you’re interested. I loved using mine! Isn’t it amazing how God made us so strong. Reading your birth and postpartum story (and any woman’s story) and then to read you’re walking around like nothing happened six weeks later is amazing. God is so good, and He made us good also. I love reading your updates on your new little blessing. Even though I am waaaay past childbirth days and am now waiting for grandchildren! Thank you for sharing your story! I’ve been thinking about you! Hope you gain your energy back soon. Congrats on your beautiful baby! I’m glad to hear that you are feeling better, hormones do crazy things to women. Take time to heal your body! Kisses to your sweet beautiful baby! You look great, Erica! I’m so happy to hear that you’re feeling better! Stretch marks are so weird. With a couple of our kids, I didn’t have any at all during pregnancy but when I started losing the baby weight, they would pop up everywhere and were dark purple! They’ve faded, but now when ever my weight fluctuates a little, stretch marks appear and then disappear. It’s so strange! So, yeah, all that to say that yours will most likely go away. Thank you for sharing your story! Oh my goodness woman, don’t worry about your belly for another few months at least! Sheesh. There are some serious hormonal things going on in your body right now and it takes time for everything to settle down. That first month can be a rough one, it’s true. I also had very intense and vivid dreams, the panicking about going to sleep. Hang in there, it all sorts itself out. You look great, Erica. Thanks for sharing your story. :) I feel like not many people talk about the recovery, but I want to have realistic expectations so this is super helpful! Thank you for keeping us up to date on your recovery and Helen’s growth. Don’t worry so about your weight. You are breast-feeding and can now eat for one and a half! I also worried about becoming my slim self after I had my first child and became dangerously thin (I am a little taller than you, but got down to 105 pounds) so be careful to eat enough and to rest, as well. Thank you for sharing your story. I think not enough people talk about how hard recovery can be, when it’s all about the labor. A dear older woman I know, and mother of 7 (almost 8) who looks AMAZING, told me ‘Your body took nine months to grow a baby and you should give it nine months to go back to normal.’ I really appreciated that, to not put pressure on myself (even though I wanted to be back in shape) and just let it happen. Honesty I didn’t do anything though, so a year later there is toning I’d like to do even though I look about the same as pre-pregnancy. But the stretchmarks that were bright red are now a faded skin tone. I also noticed a huge drop around 4-6 months from breastfeeding, which hadn’t seemed to do much for me earlier than that. Yes, postpartum can be SO HARD, and so few people talk about it… I was down and out for months. Keep at it! Surround yourself with helpful and loving people, and be sure to take care of yourself as well as your baby. All best. Hi Erica, just a “hello” to let you know I’m thinking of you and hoping you’re feeling okay. The first few months are tough, but wonderful, and it gets better every day … I hope you’re getting lots of support from your extended family and more sleep. Take care. I can so relate! We’re a very young couple, too, and I had a little boy, my first, on February 21st…my labor was induced with Wednesday night since my water had broken that morning at 4am. I went very quickly from a 2-8 and then got so stuck. They told me not to push so I had to fight the urge for at least 4 hours (I couldn’t sit down at all or it would get overwhelming so I had to keep walking which was exhausting)…then when I finally could it was very difficult. I pushed for four more hours until my midwife finally decided I needed an episiotomy, so he was finally born Thursday morning. I was exhausted–the first time I looked in the mirror my face was so swollen from pushing that I didn’t even look like myself…I had torn past the episiotomy, so I needed a lot of stitches, and every muscle I had in my body was sore. It was so hard to get in and out of bed…I definitely was forced to take it easy and I got stir crazy, too, and probably did too much. Two weeks later I got mastitis with a fever that kept climbing…it was beyond miserable. Once I got over that, my hubby got sick and so I was taking care of him and the baby all by myself and finally got sick too. I ended up having a horrible fever for another week. I was really at the end of my rope and my husband didn’t feel well either. When Jude was 6 weeks old I finally started to feel like myself again and life got a little bit easier…moral of the story–having a baby is hard work and you need to let your body recover or else you’re just asking for trouble! Congratulations on your baby Erica! I’ve been following your blog(s) for quite some time now. For stretch marks, I recommend using Lush Cosmetics’ Lovely Jubblies. It is labeled as a breast cream but naturally, the lotion can be used in various other places to help tighten and smooth skin. Pricey but very worth it (toning can only do so much). Best of luck! I look forward to reading your future posts.